1Lt James M. McDonald (P) - Flew all of his missions as Pilot. Completed his combat tour, mission #42 13 June 1943 as a Lead crew Pilot with Major Glenn E. Shumake. 1Lt Robert O. Scheible (B) - Flew his first five missions with McDonald Crew. Became a POW on 16 February 1943 on a mission to St. Nazaire, France flying as a substitute Bombardier with the 1Lt Lawrence G. Dunnica Crew. 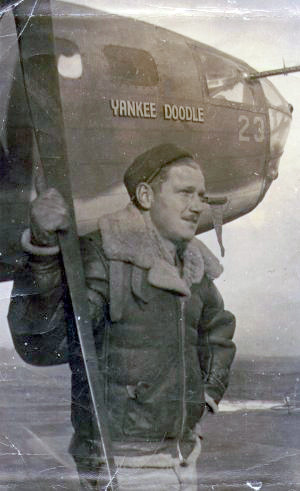 The Dunnica Crew original Bombardier, Lt James M. Montgomery, Jr. then flew 13 missions with the McDonald crew . Lt Montgomery was Killed in Action on mission #43 on 22 June 1943 to Huls, Germany flying with the Lt Ray W. Jess Crew. 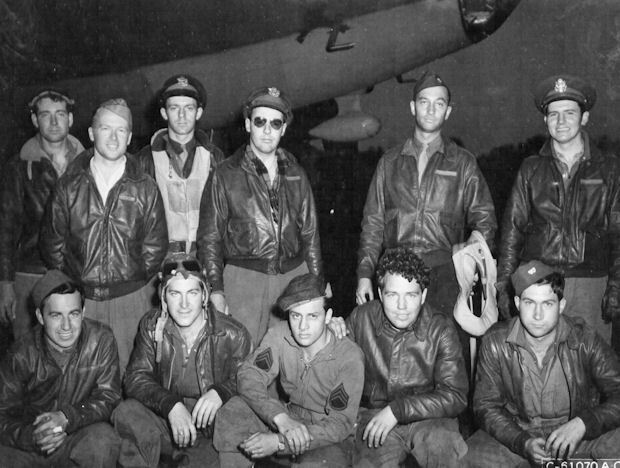 T/Sgt David D. Fanning (E), S/Sgt Glenn S. Carpenter (R), S/Sgt James E. Bruskotter (BTG), S/Sgt Robert W. Sterling (TG) - Flew all of their combat missions with the McDonald Crew and completed their combat tours. Sgt James C. Martin (LWG) - Flew his last four missions with other pilots. Last mission #47 on 29 June 1943. T/Sgt David D. Fanning (E) with B-17E #41-9023 Yankee Doodle from the 91st Bomb Group. Flying in B-17F #42-5360 War Bride. Lt McDonald saw enemy planes coming in to attack from his left. He instinctively ducked forward when the enemy fighter started firing. A 20mm shell entered the cockpit at the spot where his head would normally be. The shell tore a gaping hole in the side of the cockpit and exploded inside. Lt McDonald was untouched but the copilot received severe lacerations on his face and back. Another shell knocked out the tail guns and Tail Gunner Sgt Sterling came thorough this encounter without a scratch. Lt Scheible, Bombardier, was manning his guns when fighters were attacking. His 45-caliber pistol was resting on a shelf above his shoulder. There was a terrific explosion directly beside his head stunning him for a moment. A 20 mm shell from the FW-190 made a direct hit on the hammer of his pistol and destroyed the pistol. Shrapnel from the shell almost tore the nose compartment apart. The bombsight gyro was pierced, Lt Scheible's parachute, that he was wearing on his back, was torn to ribbons. Despite all the shell damage Lt Scheible and Navigator, Lt Clement, were untouched. A fourth 20mm shell exploded on the vertical stabilizer tearing it apart. All told about 20 shells entered the B-17 which safely returned to Molesworth. Lt McDonald aborted the mission at the English Coast when Engineer T/Sgt David D. Fanning became actively ill. Flying in B-17F #42-5360 War Bride. Formation was attacked by 20-25 enemy fighters. War Bride was out of the formation with #1 and #3 engines running rough. #2 engine caught fire that was extinguished. Engine was hit by a 20mm shell while being feathered. The crew fought off the attacking fighters downing two by S/Sgt Sterling (TG) and S/Sgt Bruskotter (BTG). 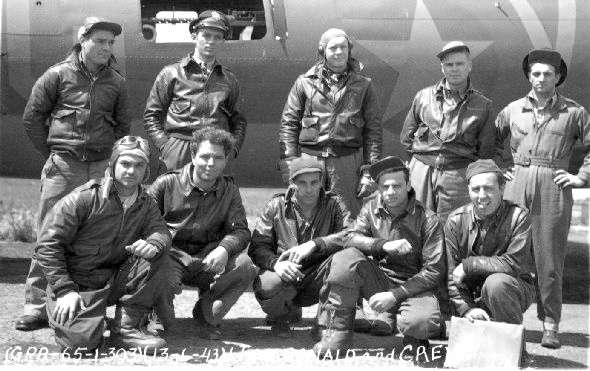 Lt McDonald landed his badly damaged B-17 at RAF Prendannack, England. Lt McDonald, flying in #42-3192 G-for-George, buzzed the Molesworth airfield at a very low altitude and dropped a very large towel. He stated - "I finished my combat stretch today, so I thew in the towel."